There is no getting around it, if the dollar is your currency, it is impossible to eat cheaply and well in London. 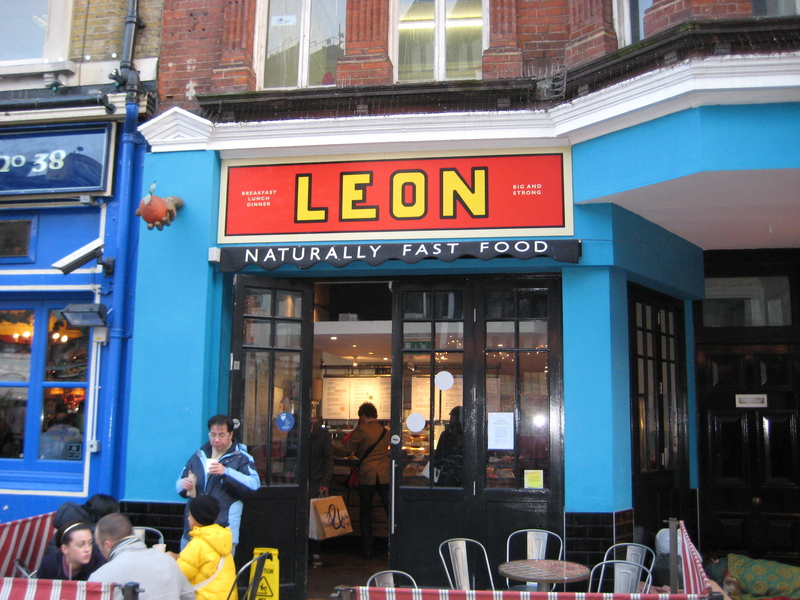 Moving into the realm of relativity, among the best, healthiest, and least expensive food in London can be found in a new chain of small restaurants called Leon. Vaguely Mediterranean dishes like vegetable salads with or without chicken, delicious lamb meatballs in a dense tomato sauce, sweet potato falafel, and freshly squeezed fruit juices occupy center stage on the menu. Don’t expect fine dining. But if you out and about, with children, feeling peckish, Leon’s is far better than most places you have to choose from. The one pictured here is near Liberty’s, but you’ll easily find their exact locations if you google “Leon London”.